Tent camping in Florida is a year-round activity. Florida state, county, and national parks offer some of the best camping in the state. The federal, state, and local governments purchased much of this land to preserve it, and the campgrounds on these lands offer some of the best vistas in the state. These parks cater to all sorts of campers, and they provide tent campers sites separate from RV campers. While private campgrounds abound in Florida, tent campers will find that the best value, sights, and activities take place in the government-run parks. Fort De Soto, a park in the southern tip of Pinellas County along Florida's west coast, has beaches, nature trails, fishing, and a host of water sports. Its north beach, voted best in the country by Dr. Beach, has beautiful sunsets, but the east beach has fantastic winds for windsurfing and kiteboarding. Dogs love the dog beach, nestled between two fishing piers, and kids and adults alike revel in the remains of the old fort. The campsites--some of which allow dogs--front either mangroves or the water. The park does an excellent job of separating campsites with vegetation. 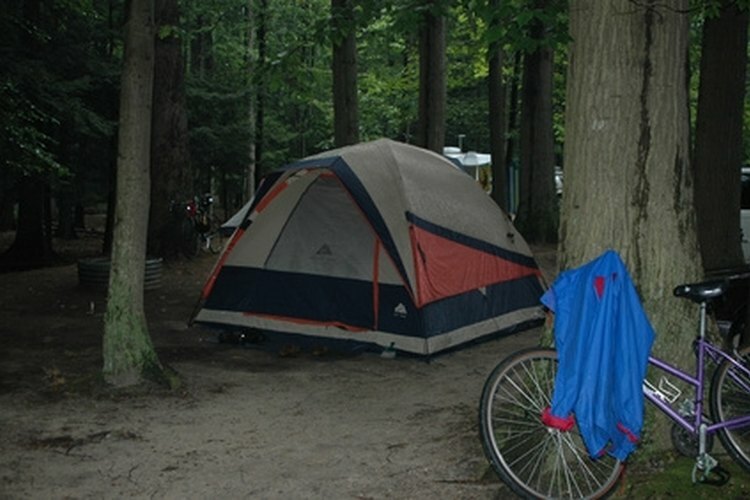 The campground has hot water showers, laundry facilities, grills, and a camp store. Reservations are accepted online or in person. Bahia Honda State Park, part of the Florida Keys, fills the entire island. The tent campsites either front the Atlantic Ocean or lie just steps away from the sand. Because the Florida Keys have very few sandy beaches, the ones in front of the tent campsites make this park one of the hardest to get into in the state. Bahia Honda (literally translated as "deep bay") has acres of trails, beaches, and lagoons. The park allows pets in the campground, although not on the beach. Each site has electrical hookups and running water. The sites also have hot water showers, laundry facilities, and a camp store (at the other end of the park). Reservations are accepted online or in person. Camping on Fort Jefferson in the Dry Tortugas is about as far away from society as you can get--70 miles, to be precise. Campers can access these primitive campsites by ferry or seaplane only, as the Dry Tortugas lie 70 miles west of Key West. As of March 2010, only Sunny Days Catamarans and Yankee Freedom offered public ferry service to the island. Campers arriving on the island should pack in everything they need, including water--the islands are called "dry" because they lack a source of fresh water. Campers often find themselves sharing picnic tables and other amenities with other campers. The Dry Tortugas is considered a primitive camping site. Once on the island, the fort, snorkeling, and swimming all await the very few people who camp there. A small National Park staff (often just one person) watches over the island at all times, but cannot provide provisions. Laundry and trash must both be addressed on the mainland upon your return.